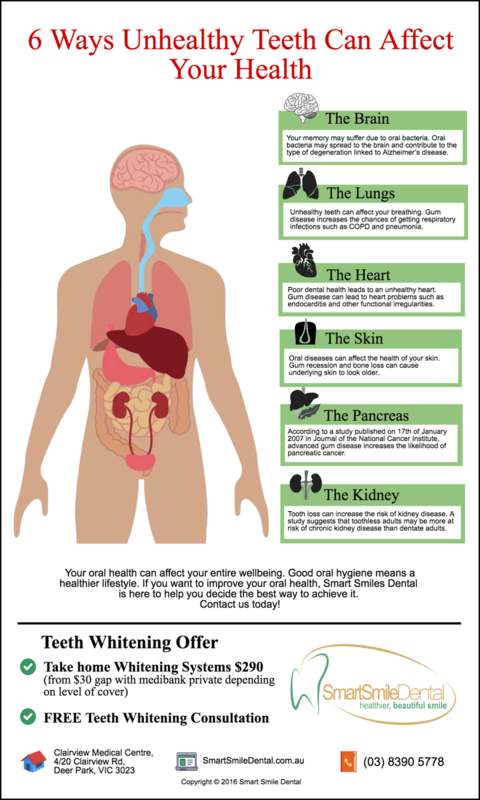 Your heart can be damaged by poor dental health. Gum disease is linked to heart problems including endocarditis and other irregularities in heart function. One theory is that gum disease can cause bacteria to enter the bloodstream where they attach to the fatty deposits in the heart blood vessels. This condition can cause blood clots and may lead to heart attacks. Suprisingly, your skin can be damaged by unhealthy teeth. Oral diseases can have negative impact on the skin that surrounds the mouth. Gum recession and bone loss can remove support structures, causing the skin over the mouth to look older. The pancreas can be damaged by unhealthy teeth. According to a study published in the Journal of the National Cancer Institute, advanced gum disease (“periodontitis”) increases the likelihood of pancreatic cancer. Kidney disease can be caused by tooth loss! A study suggests that adults without teeth may be more at risk of chronic kidney diseases than adults who have their teeth (“dentate adults”). Your oral health can effect your overall wellbeing! Good oral hygiene means a healthier lifestyle. At Smart Smile Dental we are dedicated to helping you achieve maximum dental health. Call us on (03) 8390 5778 or book your appointment online.